Wood is one of the oldest building materials in human history. From the first huts and human tools to contemporary design’s most prized creations, wood, as a material, is at the center. The appeal of timber products, in all their potential variations, endures today. A well-crafted wood piece lends timeless warmth and beauty to the heart of a home. 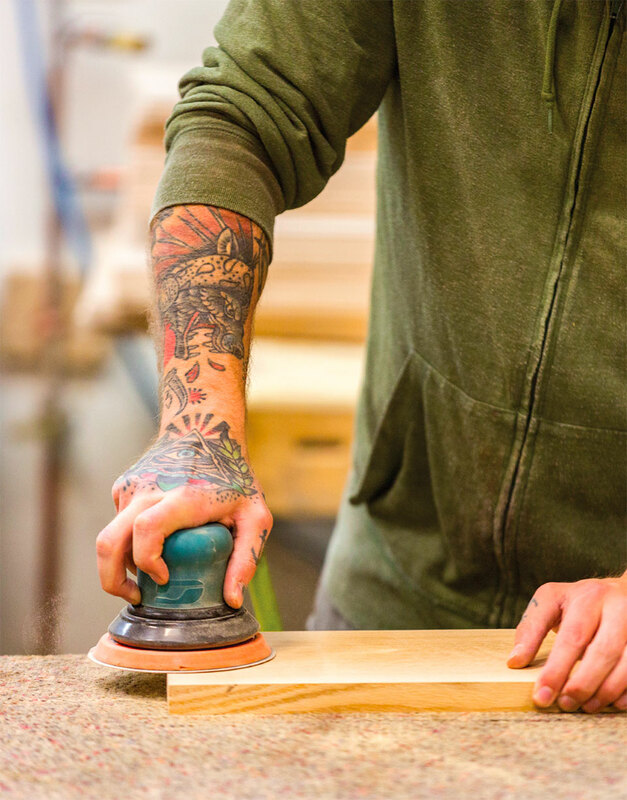 From structural elements to fine furnishings to artisan details, spotlights how expert local craftsmen create with a medium that continues to take on new and relevant forms in our modern lives. Six acres of land are stacked high and deep with over a million board feet of lumber and massive timbers spans. The wood represents an anthology of America’s last century. Each piece has a story and Pat Iwanski, who specializes in sourcing wood for Montana Timbers, knows them all. The yard is home to the bones of industrial plants with war-time history, tobacco storage warehouses from the deep South, and choice factory timbers with a disgruntled employee’s thoughts carved into the side. When Montana Timbers opened nearly 20 years ago on that horse pasture with a single saw, reclaimed lumber as a bonafide industry was only starting to take shape. Nate Boersema and Pat Iwanski, who both began their work with the company in those early years, reflect on the transformation of an industry in which they are standing on the leading edge, and on why reclaimed lumber has succeeded in becoming a predominate western architectural aesthetic that now dominates much of North America’s home design. A walk through the Montana Timbers yard is a bit like flipping through the style annals of reclaimed lumber. Traditional log stack sits out front, pointing to the roots of the industry in cabin and homestead salvage. Inside the showroom, rough-chinked rustic wall samples hang next to interior planking with far more contemporary character, and stacks of weather-greyed corral board lend a glimpse at a growing trend in the business. 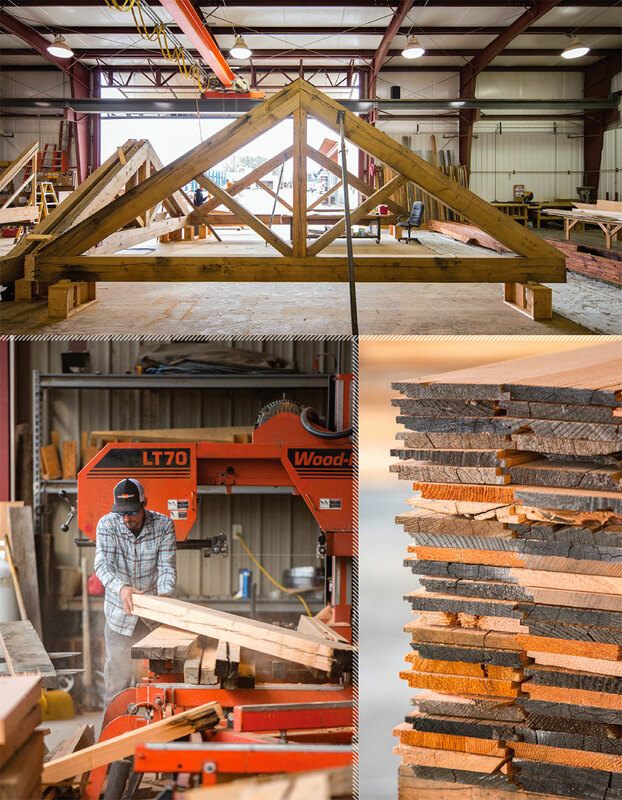 Many Montana Timbers hands touch each piece to create a final product. Once selected, wood is de-nailed and cut to size. Another team then power-washes or Teflon-brushes each piece to remove dirt and unwanted particles while maintaining the wood’s character. Finally, the pieces are kiln-dried to ensure a low moisture content. Before Pat turned to reclaiming lumber full-time, he studied history. The link between the two is clear. He’s passionate about reference points to the past that he sees in timber, but when asked if he ever gets attached to a particular piece or story, he says, “Well, we’re just their keeper for a time.” Instead, he’s managed to keep for himself a mason jar filled with spent bullets. The bullets have been pulled from the lumber of dilapidated ranch structures across the West. Just as often, he says, he pulls them from the timbers of urban industrial warehouses. Pat ponders the circumstances that might have put the bullets in those timbers. 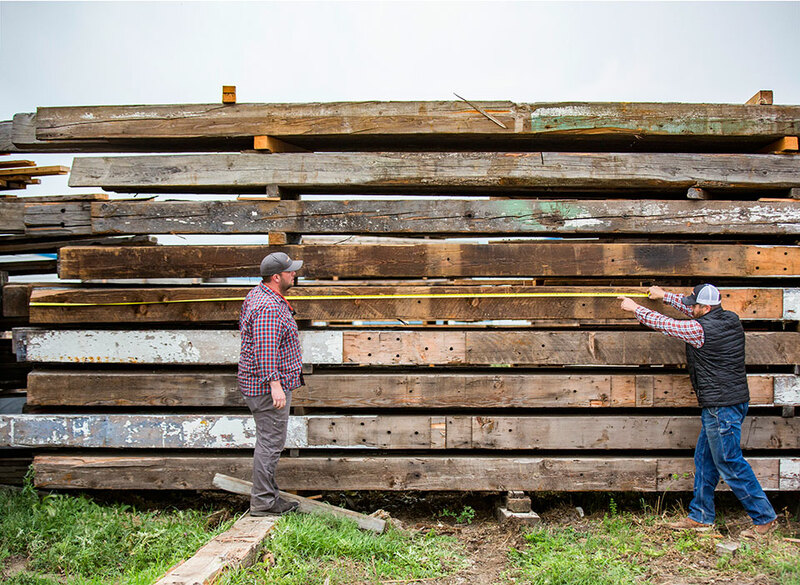 They are the tangible remnants of lumber with beautiful character, integrity, and a sense of history that Montana Timbers curates for their clients. In a furniture industry dominated by a click-to-pay, quick-ship, and one-size-fits-most online atmosphere, the idea of fine furniture being made from scratch to exact desires and specifications might seem unattainable, or a service reserved for only the most elite designers. 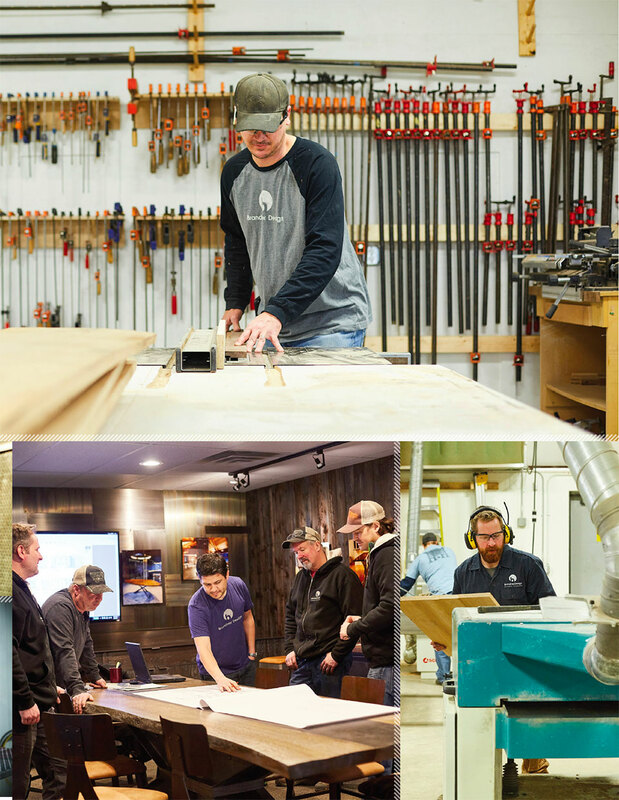 The team at Black Timber Furniture, led by Todd Fullerton, is determined to change that notion, ushering in a return to locally hand-crafted, custom furniture, with an equally well-crafted personal attention to detail. Black Timber’s Bozeman/Four Corners showroom is filled with representative styles to assist in designing the ideal piece, from a barn door to bathroom vanity to dining table and more. A reclaimed fly rod cabinet with detailed storage solutions is displayed near contemporary live-edge oak dining tables. A craftsman-style Murphy bed and desk combination piece turns a home office into a guest room on a moment’s notice. The wide variety of furniture products and styles are reflective of the range of Black Timber’s capabilities, and a process of evolution through their craft. 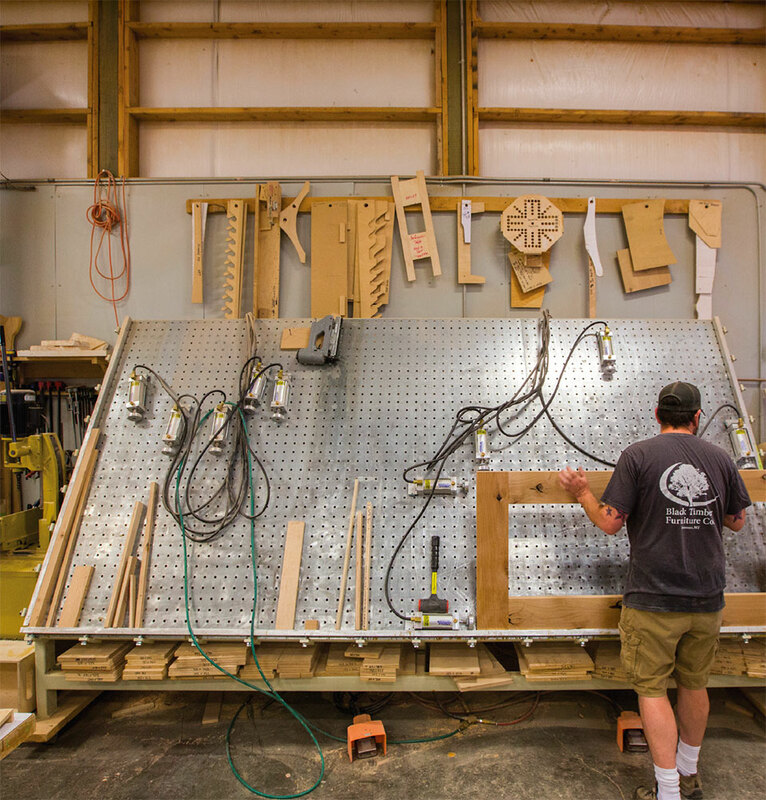 “We can take a furniture design that might read as traditional and change the type of wood and finish to make it more rustic or contemporary,” Todd says. From the consultation process, Todd, whose background pulls equally from the diligence and quiet pride of his 20 years of service in the Army and a degree in construction engineering, takes the final design to his team at their manufacturing facility west of Bozeman. 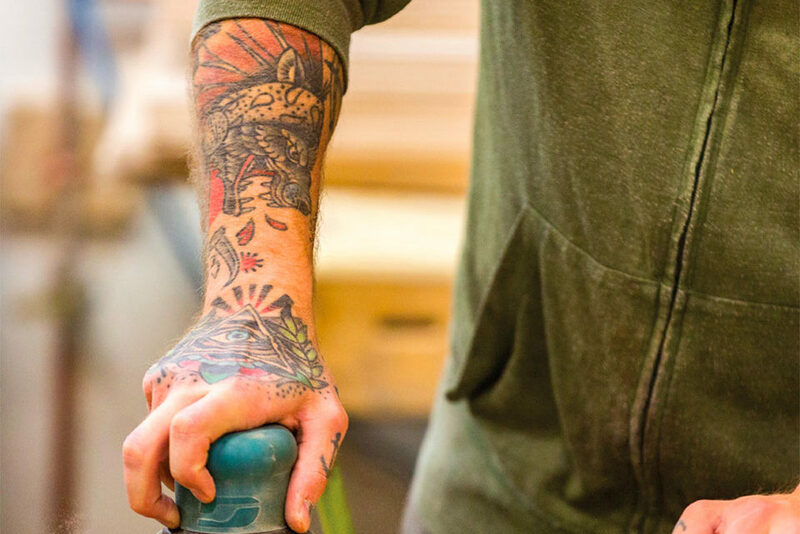 There, an organized production crew of ten people, many of whom share a history as veterans, crafts raw hardwoods into one-of-a-kind pieces using materials sourced in the United States whenever possible. Ultimately, Todd and his team seek to create solution through design. “Clients come to the showroom after having searched retail furniture stores for a piece to fit their specific needs without success,” he says. So, whether it be a designer searching for furniture to meet the grand scale of high-end architecture, or a customer needing specific storage solutions for their home office, they find themselves at the table at Black Timber because larger furniture showrooms aren’t able to provide the customization and quality that Black Timber can deliver at a competitive price point. Black Timber’s model also reflects the importance of human touch and local craft that stands in contrast to an industry increasingly steeped in imports, online sales, and cross-country shipping charges. That human touch shows in everything from the mouldered detailing of a dresser’s edge to delivery and installation by the same men who built the furniture. Craftsman Jerry Karn, who has worked with Black Timber since its inception, shares this sentiment of personal attention. “One of the most rewarding parts of the job is delivering a piece I’ve worked on to the client and getting to see their faces when we put it in place,” he says. Designing in the West offers a certain latitude of expression. The region is not locked in by a rigid framework from past styles, and thus it offers a melting pot for new ideas. Artist Jeff Brandner moved from the East Coast to Bozeman in 2005, in part, because of this freedom. He brought an appreciation of industrial steel forms from his Pennsylvania roots, and a keen eye for the craftsmanship he saw in the colonial home where he grew up. His success in cabinetry, custom furniture, and architectural installations now blurs the line of his career between craftsman and fine artist, and what he accomplishes can, on multiple levels, be described as finding balance in a wide-open field of design. 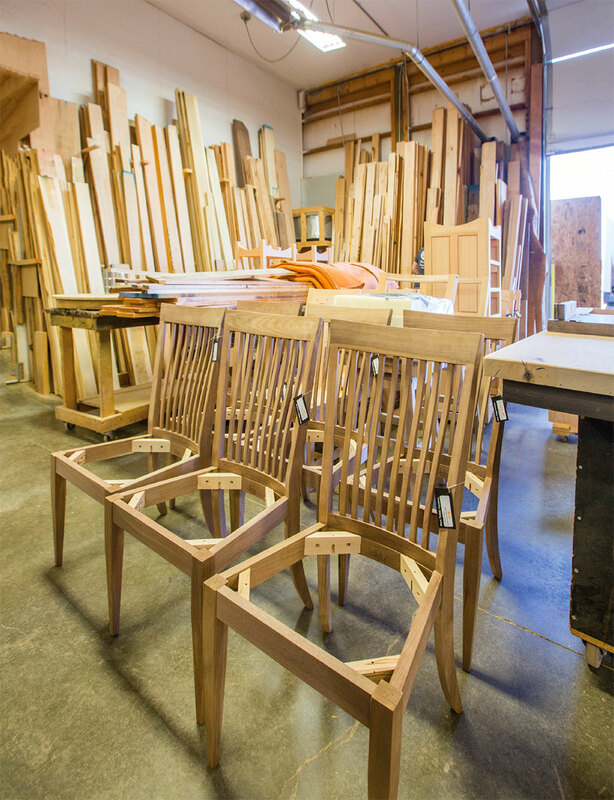 When refining wood finish techniques, the Brandner team often looks to the past before pointing to the future. The centuries-old burn finish Shou Sugi Ban is one technique that Brandner regularly uses, and has successfully modified. He adds ink stains to the process to bring color and an iridescent quality to the finished product. Cerusing, a technique first made popular in America through Art Deco design, is also made new again in Brandner’s hands. Originally, a white, lead-based pigment was used to create the grain-enhancing treatment. Brander uses a safer polymer treatment and experiments with the addition of various pigments and wire-brush techniques to develop character in the wood. The Brandner team even bakes their wood in 400º ovens to create color and depth without a single drop of pigment. For any fabricator, a balance of form and function is a baseline expectation. “What we build must work well for the client. That’s a given,” Jeff says. “But we try to push beyond that. We want to touch their senses, not just fulfill a need.” This balance is accomplished through an exploration of new materials and techniques. “When clients ask us to do things that are new, it’s a great opportunity for us to explore. Sometimes we don’t know exactly how to accomplish a client’s vision at the start. We just have to dig in and figure it out. Often, the solution we come to is better than what we originally imagined it could be. 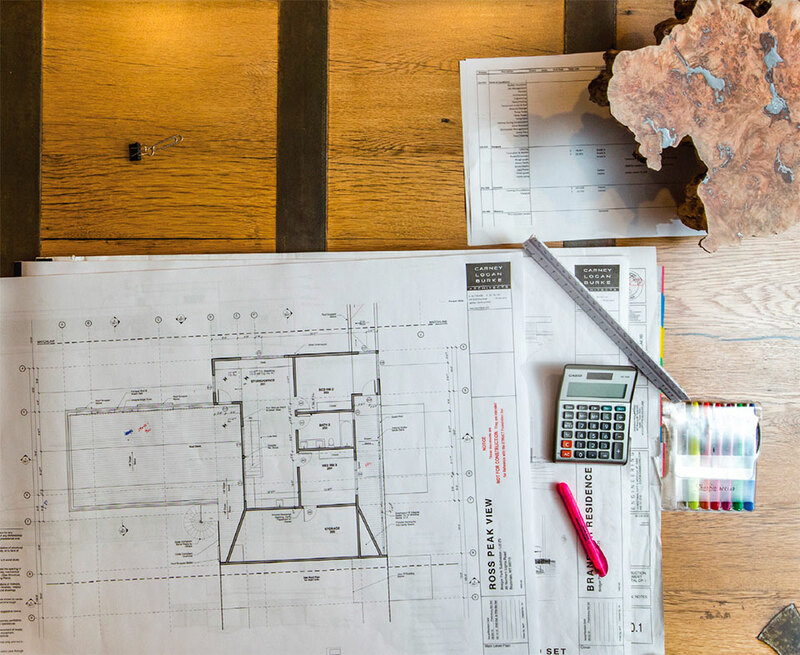 It’s a constant evolution of our work from project to project.” The process of digging in and figuring it out is also quite representative of the wide-open West, a place that Brandner Designs celebrates and continues to discover through their craft.